I am a lover of fine Italian food, but for some reason, I sometimes don’t have the time to go and visit all the restaurants I would love to (also, I wish I had an unlimited budget, which I don’t). So, I am glad that we (JT and I) had an opportunity to (FINALLY) visit La Buca, in Dunbar/Southlands. Anybody who knows me even a little bit will know that I’m a lover of all things “restaurants and other things in urban spaces where you would never even think they are there”, and La Buca is one of those. Located on Macdonald, near King Edward (25th Avenue), La Buca is somewhat off-the-beaten path. But it’s worth the trip. Classic regional cuisine is the star at this bustling neighbourhood trattoria. Here, rich flavours and hearty dishes inspired by the Italian countryside command an audience that is never disappointed. Black and white tiled floors, a 32-seat dining room, and a walk-through kitchen. Step inside La Buca and you’ll feel right at home. 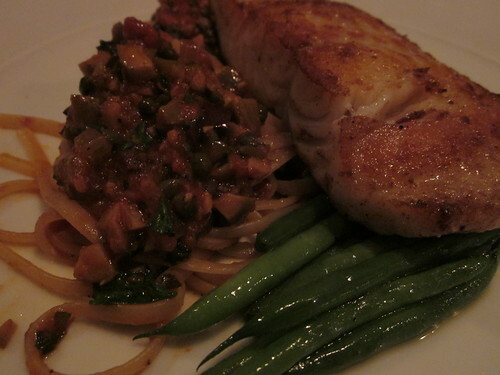 Coincidentally, the night we were there for dinner, La Buca was offering Ling Cod in Puttanesca Sauce. I usually compare Puttanesca pastas across the board to decide whether I like a place or not. I have to admit, I loved the Puttanesca sauce at La Buca. While I was a bit taken aback by the presentation (because I ordered the Ling Cod, with an extra bit of pasta sauce), I loved the flavours. Puttanesca is a sauce that needs to be discreet and subtle or otherwise it’s extremely overpowering. 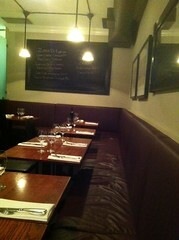 I found La Buca’s Puttanesca flavourful, without “yelling out”. As in, cooked with enough subtlety that it made me consider it a gourmet dish rather than just a bunch of olives, capers and garlic thrown in a tomato sauce. Overall, it wasn’t an expensive dinner ($66 before tax for both of us), and I am really thrilled at the outcome. I’ll definitely come back again. Besides, the service was good (I wish we had had our water glasses refilled more often, but as far as the quality of the food and how accommodating they were to me and JT, I have absolutely no complaints). Worth visiting. Disclosure: I paid for both my and JT’s dinner on my own dime.